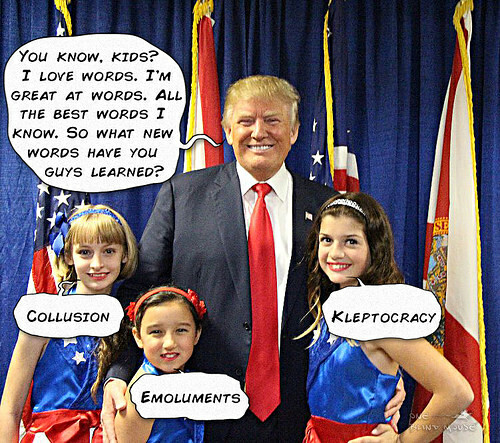 noun: A secret cooperation for fraud, treason, etc. From Latin colludere (to play together, to conspire), from col- (with) + ludere (to play), from ludus (play). Ultimately from Indo-European root leid- (to play), which also gave us allude, delude, elude, illusion, ludicrous, Ludo, ludic, and prelude. Earliest documented use: 1397. From the literal meaning “to play together” to the current meaning “to conspire”, this word has gone to the wrong side of town. But it’s not the only one. The word conspire means, literally, “to breathe together”, meaning to be in harmony. We shouldn’t insist that because a word’s origin means so-and-so, the word should mean the same today any more than that because a person is born into a distinguished family he must be a fine person. Ken Olive; Goldie’s Garden; Lulu; 2010. 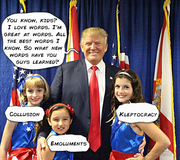 See more usage examples of collusion in Vocabulary.com’s dictionary.